Painting by Henri Moret (1856-1913). 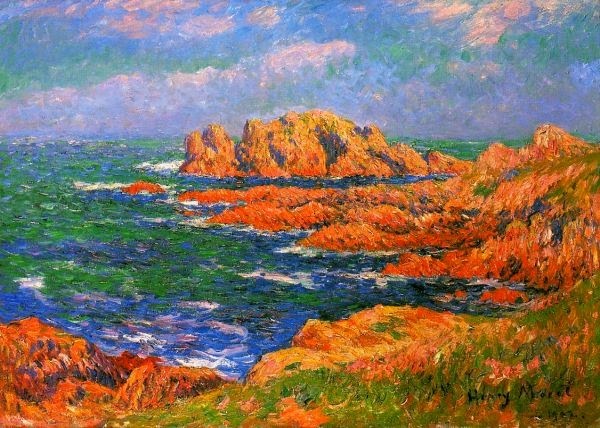 As numerous as are the rocky inlets of the Brittany coast, so are the views that Henri Moret painted of them. He favored bright colors and a texture that fit the rugged coast, and only occasionally included inhabitants or structures. More rare than finding many people in his images are paintings that have an ambiguous title: the titles of his works usually identify specifically the location, perhaps as a way to be clear that not all bits of the Brittany coast are interchangeable. In this image it appears that the intensity of interaction between rock and cloud gives off clouds of the same color as a byproduct.